Few political or social positions in and of themselves should disqualify a person from being a candidate for president. Just about every candidate will differ with any of us even on something we consider important. That is why I admire pro-life Republicans, such as former Arkansas Gov. Mike Huckabee, who argue that a pro-choice position should not automatically disqualify a Republican from pro-life Republicans' support. A big tent is necessary in politics or one ends up with a small tent and no power. Thus, I could support politicians with whom I differ on taxation (I support a consumption tax), on education (I support vouchers and think the Department of Education should be disbanded), on a flag-burning amendment (I'm against), on an amendment defining marriage as a man-woman institution (I'm for), and on many more divisive issues. But there are a few positions that are either so immoral or so destructive or so foolish that a politician who holds them cannot be considered a viable candidate. Campaign finance reform, such as the McCain-Feingold bill, falls into the latter two categories. It is particularly destructive to society, and it is particularly foolish. The primary consequence of most campaign finance reform has been to ensure that more and more extraordinarily rich people run for office. News media have just reported that New York City Mayor Michael Bloomberg is considering running for president on a third party ticket if he is not happy with the nominees of the two major parties. He is willing, the reports noted, to spend a billion dollars on himself. As his worth is about $6 billion dollars, this is quite feasible. Why shouldn't he? Thanks to campaign finance reform, Jon Corzine and Frank Lautenberg bought New Jersey's two Senate seats. By prohibiting a billionaire from giving more than $2,000 to anyone else's campaign but his own, campaign finance reform has ensured that with few exceptions, only the super rich will run for office in races that demand great expenditures of money. According to the New York Daily News, these are the net worths of presidential contenders: "Mitt Romney tops the fortune fortunate with a stash estimated at $250 million . . . Rudy Giuliani, as much as $70 million, John Edwards, as much as $62 million, John McCain, about $25 million, Sen. Hillary Clinton probably more than $15 million, and New Mexico Gov. Bill Richardson, up to $10 million." I understand why liberals support it -- by limiting access to the political process, incumbents and, most significantly, the media are empowered. Any time a few wealthy people can boost the chances of a Republican candidate, the power of the liberal media to influence elections is reduced. That Sen. Russell Feingold, a liberal Democrat, would support campaign finance reform therefore makes perfect sense. That a Republican senator -- let alone one who calls himself a conservative -- would do so boggles the mind. When asked about campaign finance reform in the last Republican debate, he argued for it and by extension for the Senate bill that bears his name -- McCain-Feingold. He argued that such reform was necessary because politics is "awash in money." Of course, campaign finance reform has not reduced the role of money at all. It has merely shifted it to organizations that have far less transparency than candidates have and ensured that the wealthy disproportionately run for office. That is how damaging campaign finance reform has been to American democracy. 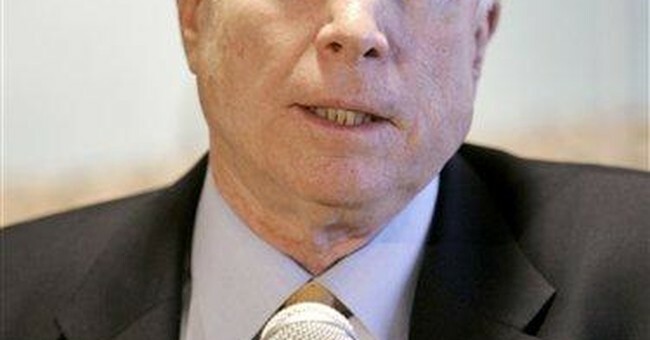 And that is why John McCain, a good man and a great American, cannot now get my vote. Which is quite something considering that I voted for him against a governor from Texas in the 2000 California presidential primary. Now let's get Rudy Giuliani's views on the matter. The former mayor told me a few months ago that he had not given it much thought. He needs to.